Four season Tree of Life pendant. Spring, Summer, Fall and Winter are represented in this wheel of the year tree of knowledge. Wire Wrapped Jewelry handmade. Peridot, Aventurine, Carnelian and Quartz gemstones as the colors of the year. This pendant is handmade using painstaking wire-wrapping techniques. Non-tarnish sterling silver plated wire frames and encircles the pendant, and non-tarnish sterling silver plated wire is then used as the roots, trunk and branches of the tree. 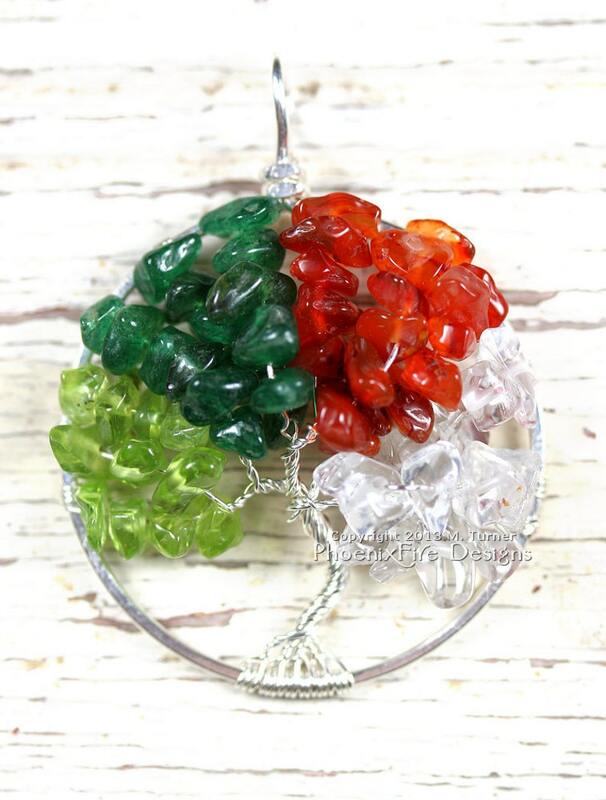 This Tree features four separate and unique gemstones to represent the Four Seasons. Spring (Peridot) - Peridot is a natural, semi-precious gemstone in the most amazing green color. The birthstone of August, it has been considered sacred and a symbol of purity for thousands of years. It was considered a stone of Springtime and a gift of Mother Nature by the Ancients. It is a stone of lightness and beauty and is said to enhance wellness in the spiritually aware. Summer (Dark Green Aventurine) - Aventurine comes in several colors. This particular color is one I just got in and it's stunning. It has an inner sparkle to it due to the mica content in the quartz matrix. Green Aventurine is the stone of luck and chance. It is said to increase perception and creative insight and is associated with the heart chakra. Autumn (Red Carnelian) - Red Carnelian is a natural gemstone with an interesting past. Originally it was strictly the property of the noble class and people of high social standing were often buried with this stone. Associated with the Second Chakra (the spleen), it is said to give energy, aide in the prevention of negative vibrations and calm the temper. It's also known as an energy booster, red carnelian is said to draw energy flows to the wearer. Winter (Clear Quartz Crystal) - Quartz crystal is a clear variety of quartz that was first found high in the frozen mountains of the Alps. Ancient people believed it was a form of ice crystals that would never melt. It is said to have cooling powers and is a romantic stone. This Tree is a beautiful representation of the Wheel of the Year and would be a wonderful gift for anyone who is attuned to the seasons such as Wiccans, Witches, Pagans and other Earth-lovers or truly anyone who simply loves the beauty of each season. Your tree will be made-to-order. Each piece is handmade and thus no two are ever alike. Please allow a little bit of natural variation. Just like a real tree in Nature, each handmade tree is a little bit unique!